Severe thunderstorms have developed over parts of Texas, Oklahoma and Arkansas Friday evening, all part of a large storm system that is expected to bring heavy snow over the Plains and Upper Midwest, more severe weather to the mid-Mississippi River Valley and heavy rainfall across northern Illinois. 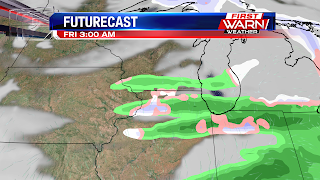 Increasing moisture Friday night will lead to dense fog and a slight chance for light freezing rain or wintry mix across far northern Illinois and southern Wisconsin after Midnight. Temperatures will continue to warm through sunrise Saturday, changing any wintry weather over to mostly rain. However, there may still be a light mix across southern Wisconsin through mid-morning Saturday. Rainfall is expected to increase in intensity mid to late morning Saturday with scattered showers lasting through the afternoon and evening. A warm front will lift to roughly the I-80 corridor Saturday with the potential for a few stronger thunderstorms to the south. North of the front (where we will be located) a chilly, wind-driven rain will occur. This dynamic storm system will continue pulling moisture out ahead of it with rainfall amounts adding up between half an inch and an inch by Sunday morning. Low pressure will track closer to northwest Illinois Sunday morning before passing over north-central Illinois Sunday afternoon. This will allow colder air to wrap back in during the afternoon and evening Sunday. 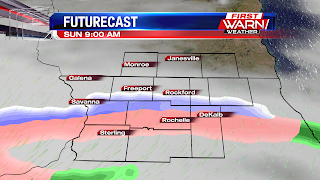 A wintry mix of rain and snow will be likely with a transition over to all light snow by Sunday evening. A quick inch of snow will be possible for some by Monday morning. 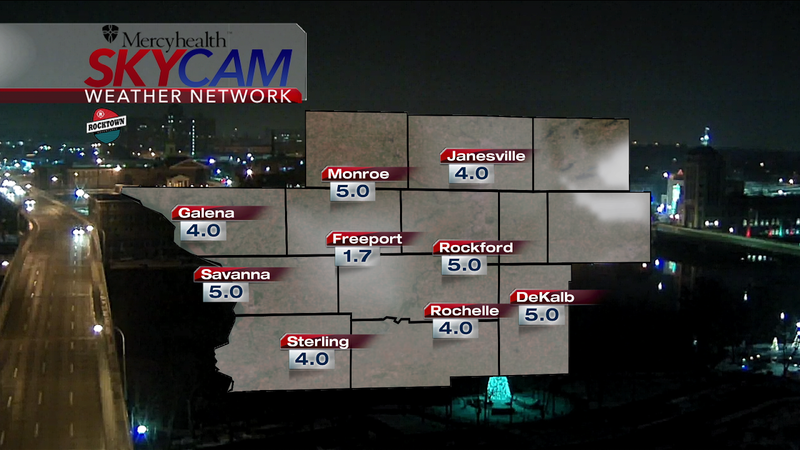 Many across northern Illinois woke up Friday morning to dense freezing fog. While most of the fog evaporated mid-morning, there was still a noticeable haze through much of the afternoon and evening. 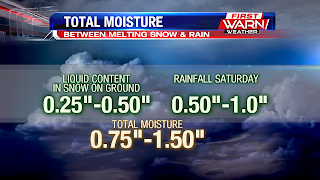 Melting snow and increasing moisture Friday night will lead to the development of more dense fog into Saturday morning. Temperatures have fallen below freezing and will remain that way through the overnight, before rising above freezing by Saturday morning. 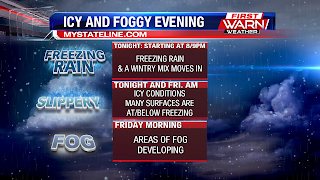 Freezing fog will be likely once again as temperatures have fallen below freezing. This will cause slick spots during the overnight, so take caution if you plan on any traveling. Temperatures should warm enough to get rid of the freezing potential Saturday morning with then rain through most of the afternoon. Dry air initially a couple thousand feet above the surface Thursday evening prevented much of what was showing up on radar from reaching the surface. 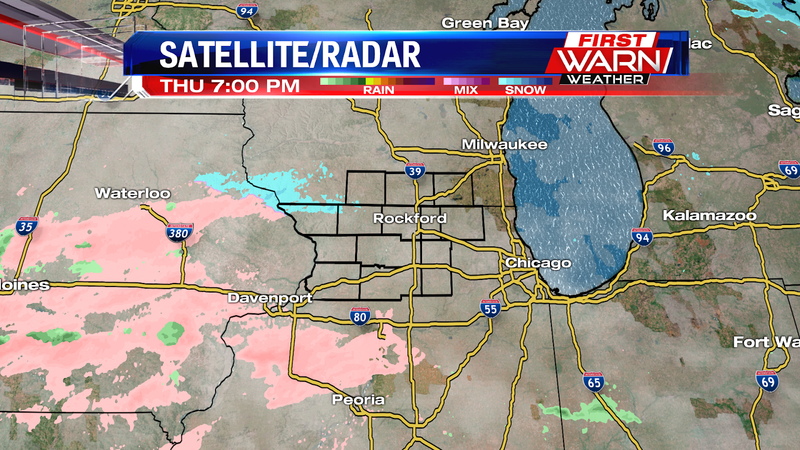 But now that the atmosphere is a little more saturated, reports of sleet and freezing rain have been coming in across northern Illinois. The reports are spotty, and not widespread, but even with light precipitation - especially freezing precipitation - it can have a big impact on travel. Main road temperatures (more of the traveled roads) are near or slightly above freezing, but lesser traveled and secondary roads may have a thin glaze of ice on them by early Friday morning. The same will occur for elevated surfaces, parking lots, sidewalks, etc. 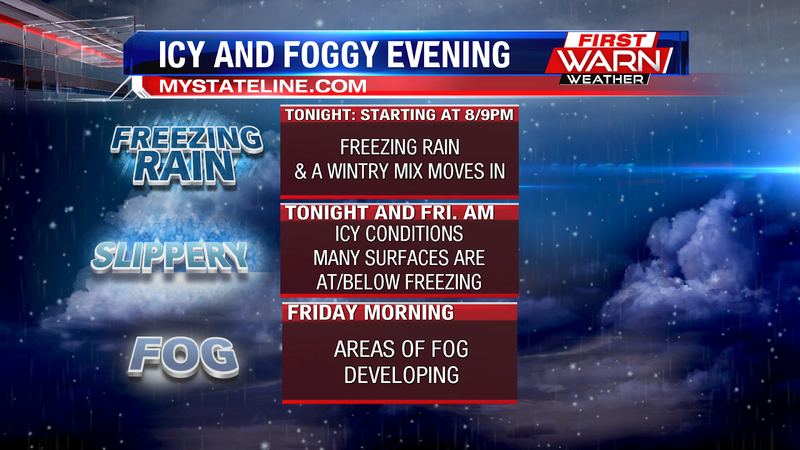 You can't see black ice so make sure you're a little extra cautious during the commute Friday. 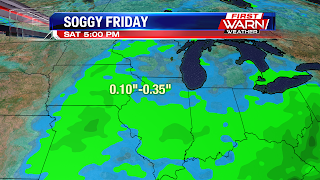 Most of the precipitation will be wrapping up around 2am/3am Friday morning. 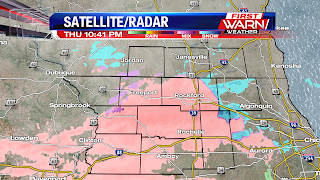 Freezing rain is just off to our west, and will be moving in over the next few hours. 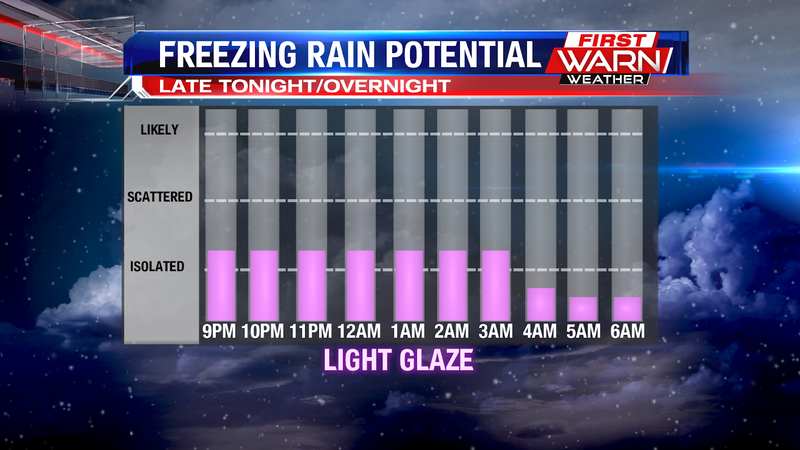 We also could see the chance for a little bit of wintry mix. 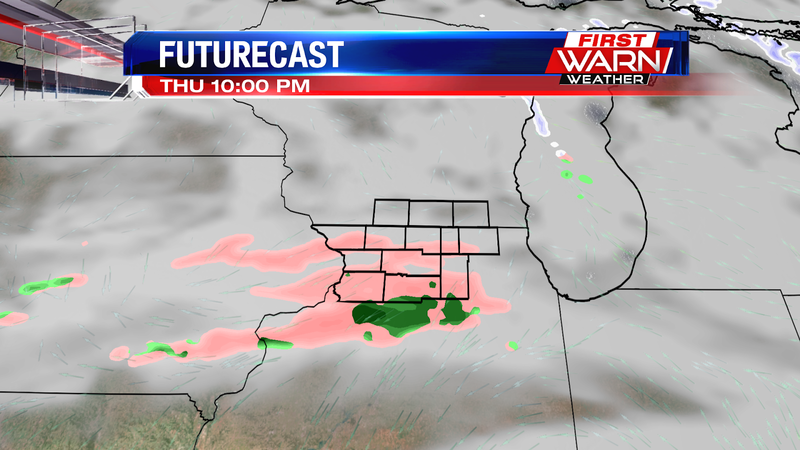 Futurecast shows the freezing rain and wintry mix will linger overnight and into the early morning hours of Friday. 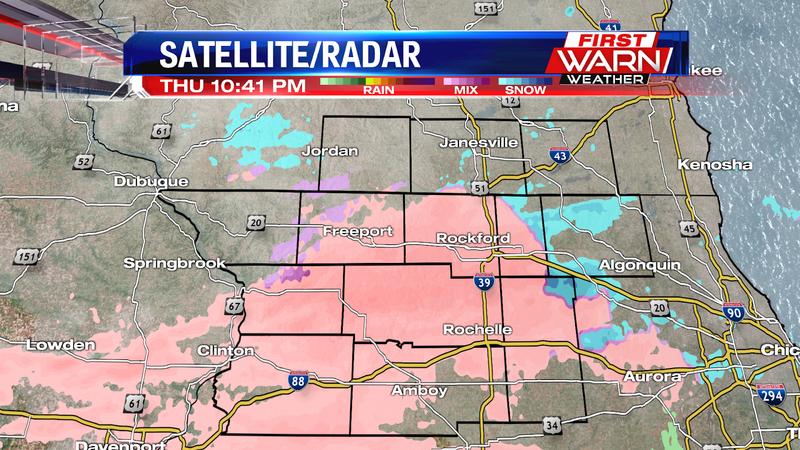 Take it slow tonight and early Friday as the freezing rain will create icy conditions because many surfaces are at/below freezing across the Stateline. 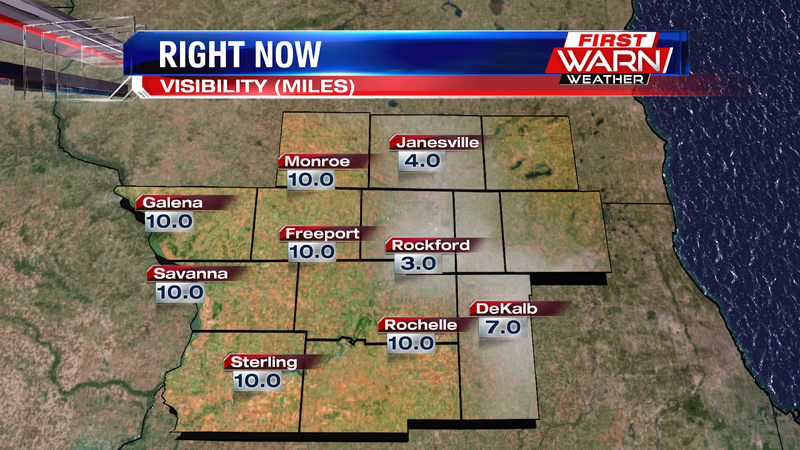 In addition, some areas of fog will develop into your Friday morning commute. 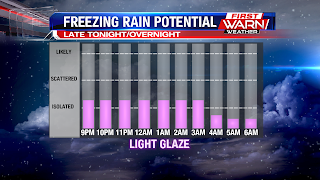 We have the chance for some freezing rain/wintry mix late tonight and into early Friday morning. In addition, some areas of fog will develop overnight and into the morning commute. Going into the weekend, temperatures will warm to near seasonable levels. We will top out in the upper 30s and lower 40s this weekend. But with all the snow we have on the ground from the record breaking snow Sunday-Monday, a warm up this weekend will mean quite a large amount of snow melting. Not only will it be warm, but it will also be rather windy and rainy Saturday. 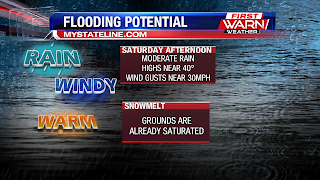 With the moderate rain, highs near 40° and snow already on the ground... we could be dealing with the potential for flooding because the ground throughout the Stateline is already saturated. Light snow falling Wednesday night will be done by Thursday morning, but not before producing a dusting up to half an inch. Warmer temperatures Thursday evening will allow the potential for light freezing drizzle or freezing rain into Friday morning. possibly a lot of it. 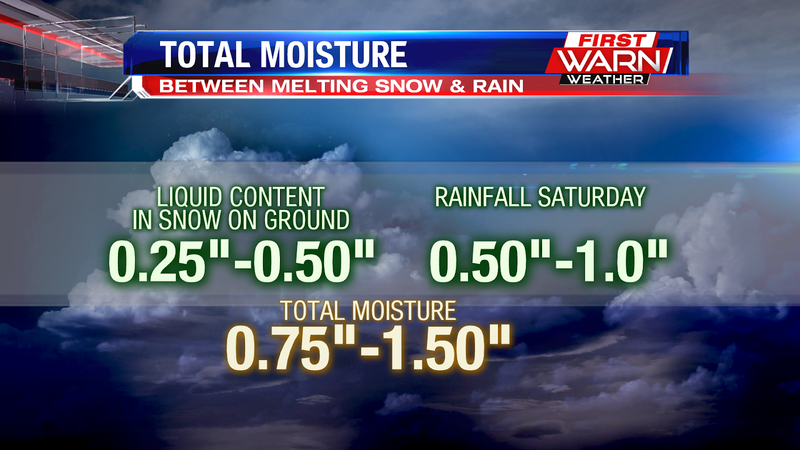 Moisture values rise close to an inch in the atmosphere which could lead to rainfall totals of half an inch, up to an inch of rain by Saturday night. 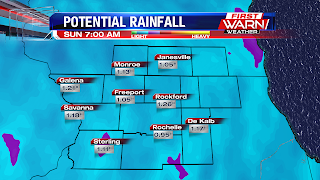 If rainfall totals are that high, the runoff potential could be high with flooding in ditches and backyards, and possible rises on local creeks and rivers. Rivers, while not in flood stage, are still high from all the heavy rain back in October. 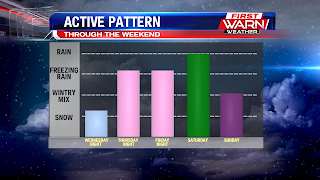 By Sunday cold air wraps in which could cause the precipitation to switch over to a mix before light snow Sunday night. 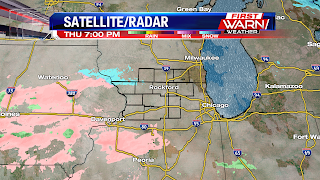 Light snow has developed over southern Wisconsin and northern Illinois Wednesday evening as low pressure moves through south-central Iowa. 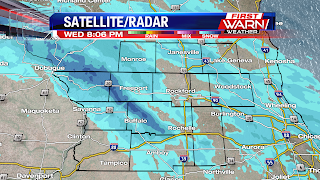 The snow will continue into the early overnight with a few flurries lasting into Thursday morning. 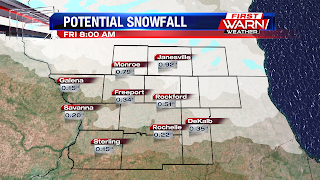 Accumulations will remain light with a dusting, up to an inch, possible. With the cold temperatures recently any snow that does accumulate will stick and this may cause some slick spots, especially on parking lots, driveways and sidewalks early Thursday morning. 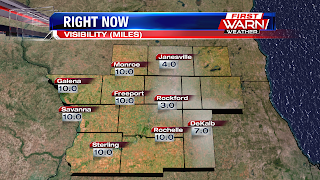 Visibility will also lower this evening as the snow comes down. This may have a little impact on the roads this evening. 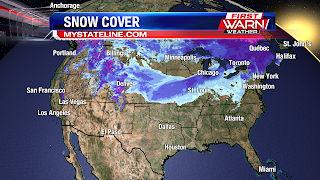 After record breaking snow Sunday and Monday, we are looking at quite a bit of snow cover across the Stateline. 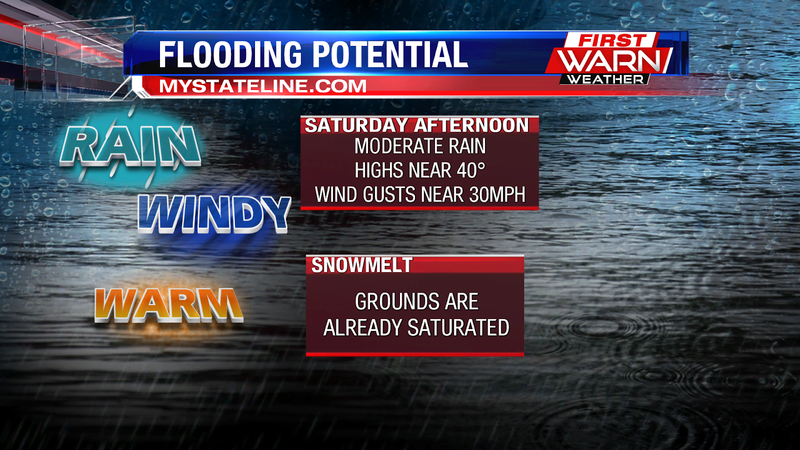 With highs expected to warm into the upper 30s and lower 40s this weekend, we could be looking at some flooding concerns. 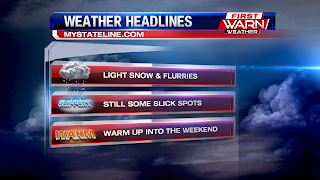 Not only will we see a warm up, but it'll come along with some mixed precipitation. Compared to just 1 year ago... as you can see hardly any of the Continental United States had any snow cover. 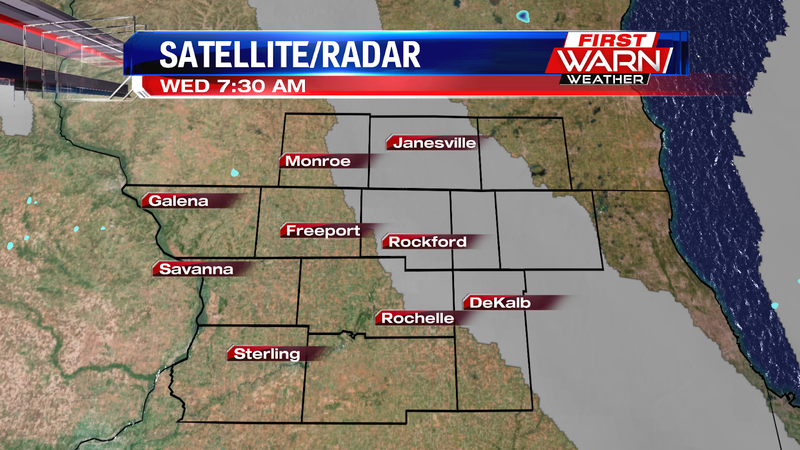 It was a chilly to the morning throughout much of the Stateline. 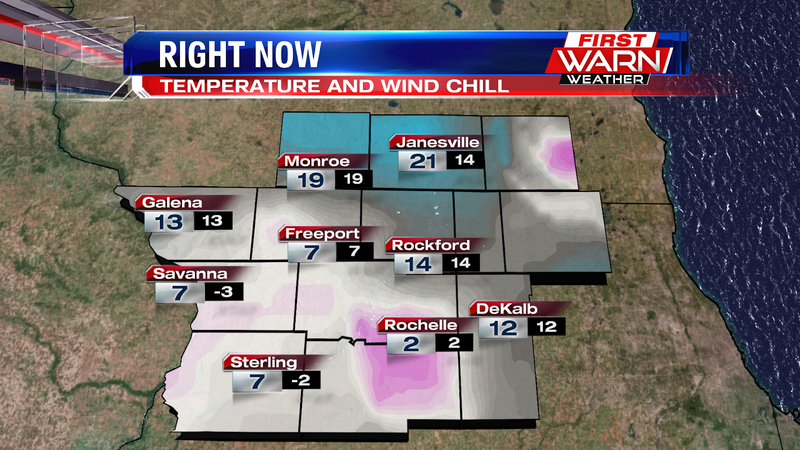 Southwestern portions of the area where in the single digits with wind chills in the negative single digits. 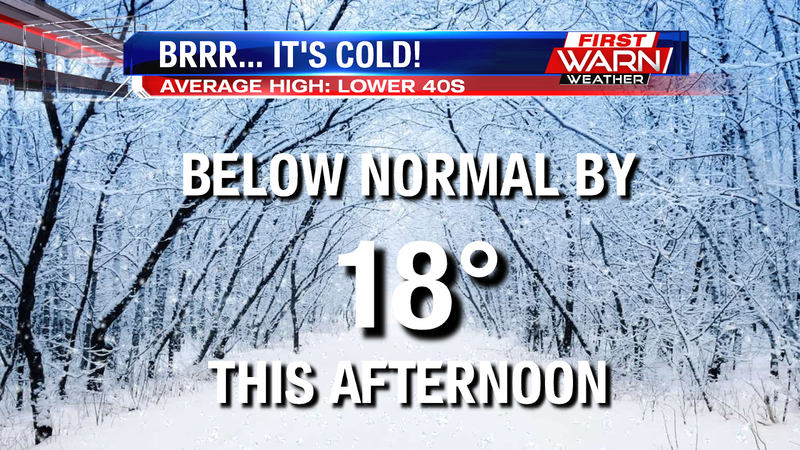 But there was an area that was still in the teens and lower 20s. That warmer area of the Stateline was stuck under a layer of cloud cover. The cloud cover acted as a blanket helping to trap the warm air. While we will warm into the mid 20s, so slightly warmer than yesterday... we will still be nearly 15 degrees below average. Late this week and into the weekend, we will see temperature back closer to normal. A rare phenomenon occurred in northern DeKalb County following the record breaking snowfall Sunday. These balls of snow are called 'snow rollers' and the conditions in the atmosphere for them to form have to be just right. It looks like someone went out into the field and rolled a bunch of snowballs, but it's actually the wind that causes the snow rollers to form. 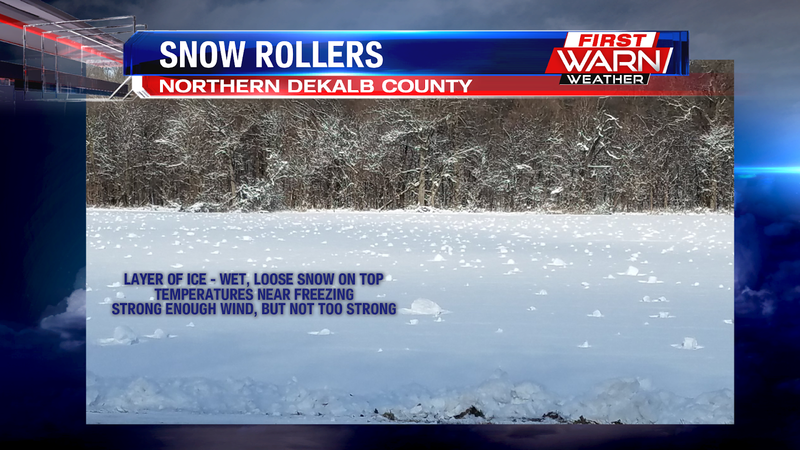 The conditions under which they form have to be just right - wet, loose snow on top of a thin layer of ice, surface temperatures right around freezing and strong winds, but not too strong otherwise the snow would break apart. These can sometimes form after a bigger snow storm, but not always. And because the conditions have to be just right, they don't occur that often. So when you do see one, it's a pretty cool sight!! 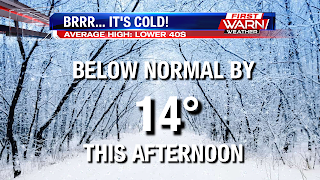 While our highs should be in the lower 40s, we will only be in the lower 20s today and then single digits tonight. That's nearly 20 degrees below average. Highs by Friday/Saturday should be briefly back into the upper 30s and lower 40s. After a few light scattered snow showers and areas of areas of patchy flurries this morning we will see decreasing clouds. Skies should turn partly to mainly clear tonight. 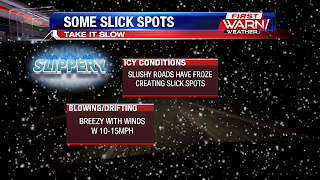 Take it slow today as it is still slick in some spots. The good news is that we will warm it up to near 40 degrees going into the weekend. 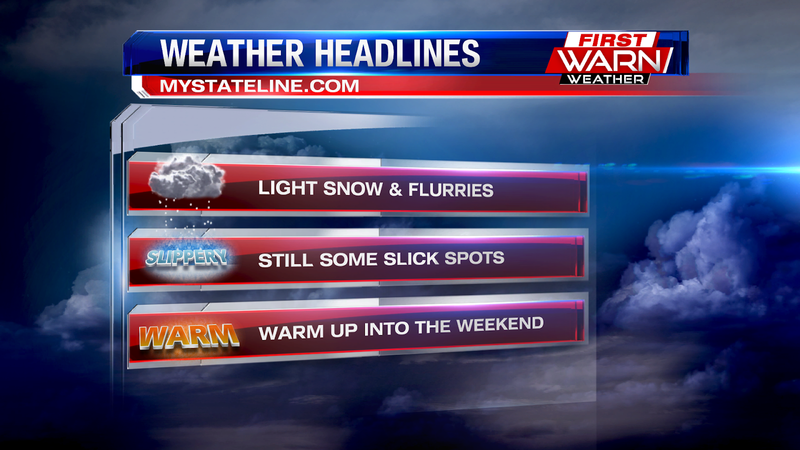 Some slushy roadways last night to have froze and created some slick spots throughout the Stateline. 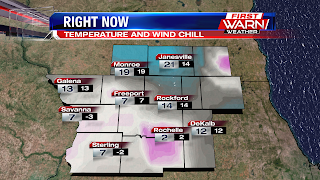 Winds will be rather breezy today, which will also cause some blowing and drifting snow. 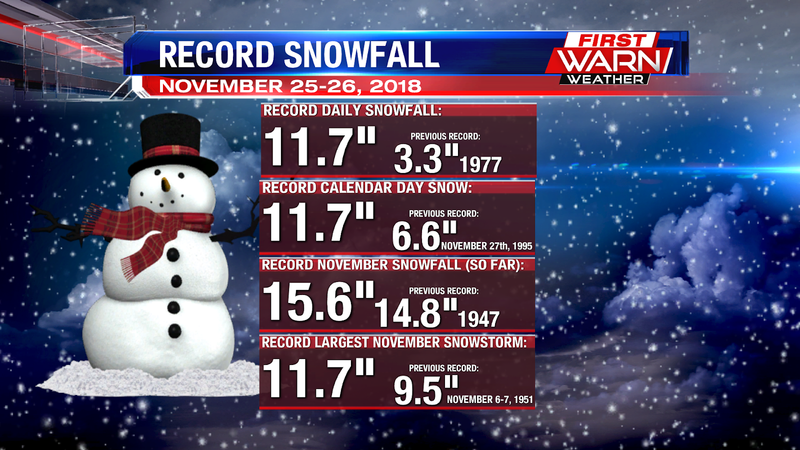 When it was all said and done, the snow from Sunday and yesterday broke numerous records in Rockford. 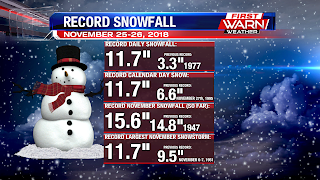 The 11.7" of snow picked up at the Rockford Airport set a daily snowfall record, calendar day snow record, November snowfall record, and the record for the largest November snowstorm. 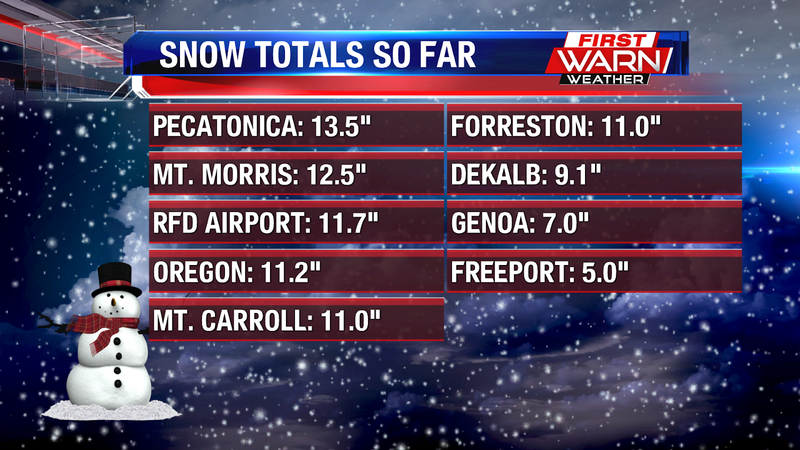 Much of the viewing area picked up around a foot of snow. Mt. 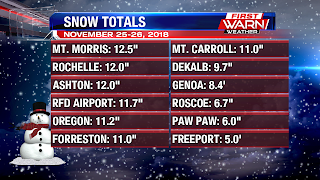 Morris, Rochelle and Ashton picked up the most, but there was a sharp cutoff in accumulations throughout northwestern portions of the viewing area. Not only was it snowy, but also rather windy. 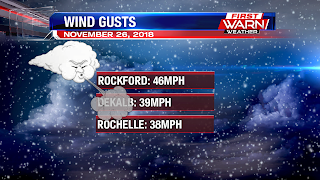 Gusts were upwards of 46mph in Rockford, 29mph in DeKalb and 38mph in Rochelle. The accumulating snow has come to an end but the impacts from nearly a foot of snow will still be felt throughout Monday morning. 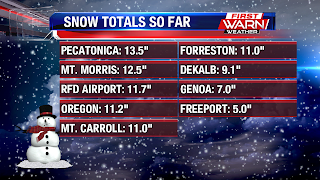 Snowfall totals added up to nearly a foot, with Pecatonica receiving 13.5 inches of snow on Sunday! 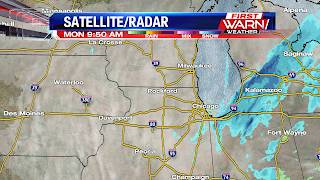 Clouds are pretty thick Monday morning and there have been a few flurries and even some light snow showers further to the north across Wisconsin and back across central Iowa. As an upper level disturbance passes through the Great Lakes this afternoon and evening, there may be a few flurries that fly over southern Wisconsin and northern Illinois through the evening. 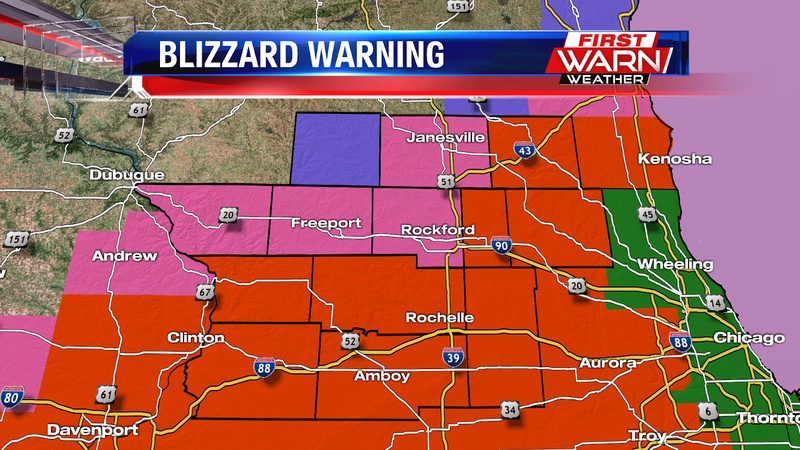 The bigger story will be the wind and blowing/drifting snow. Significant impacts on the roads Monday morning were felt with slow moving traffic and snow covered roads. Many of the county and township roads became impassable Sunday night, and were still that way early Monday morning. 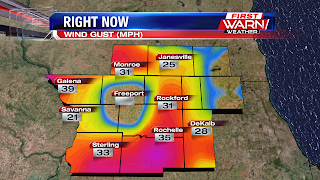 Winds were gusting close to 40 mph overnight Sunday with blowing and drifting snow lasting into Monday morning. 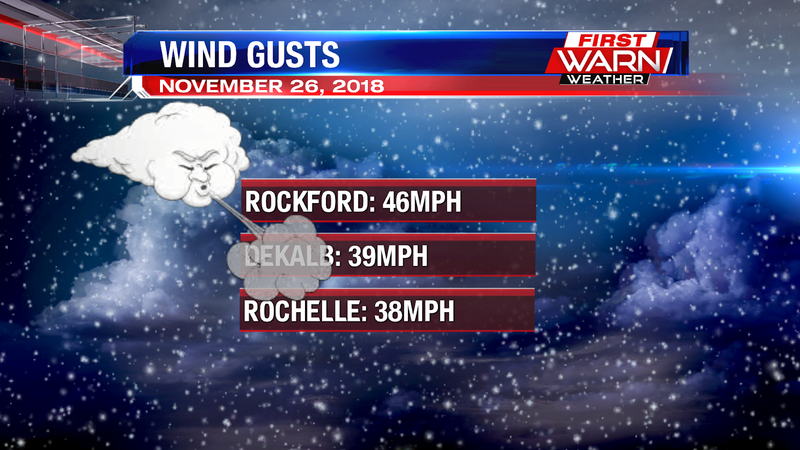 Even still as the winds have come down some, blowing and drifting snow will be an issue for both east/west and north/south roads during the afternoon. Winds won't be quite as strong Monday night but will increase to 20mph during the day Tuesday. 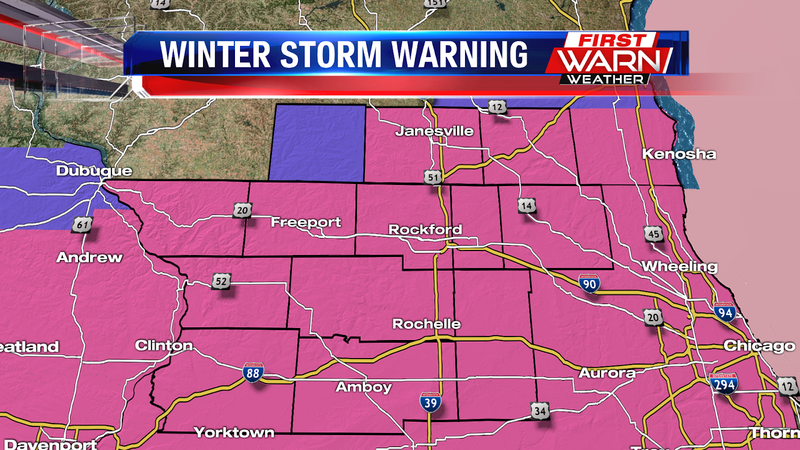 This means that there will likely still be some blowing and drifting snow in open and rural areas. 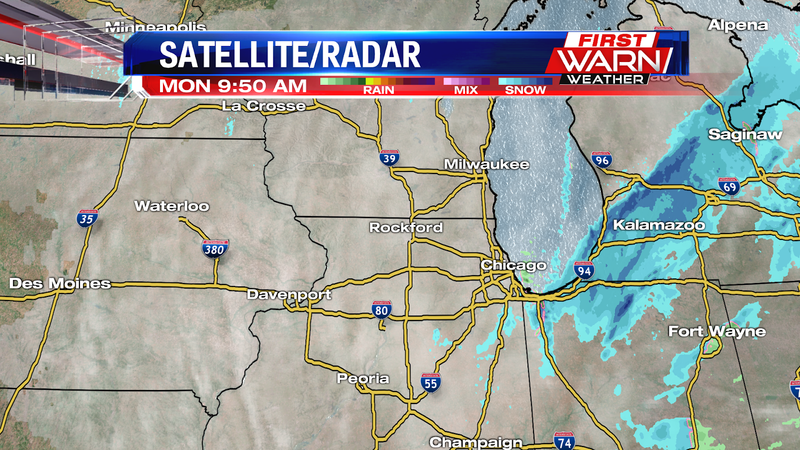 IDOT is still reporting many roads, highways and interstates as snow or ice covered at 9:45am. It'll take a while for plows to completely clear the roads. For a continuous list of how much snow has fallen over northern Illinois and southern Wisconsin, click here. 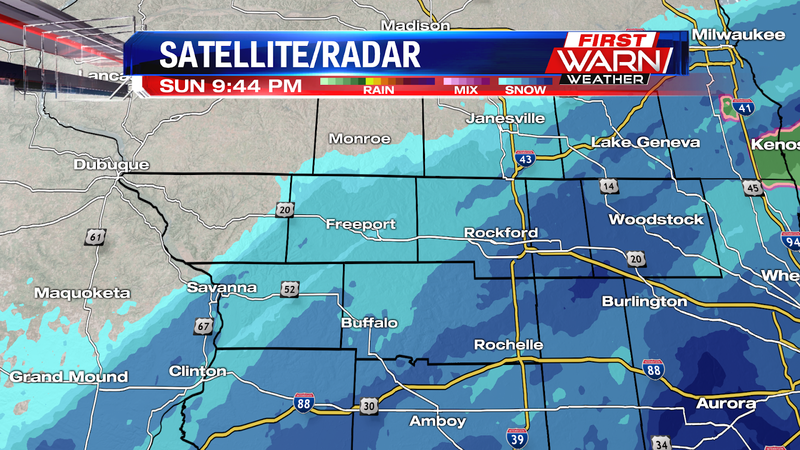 9:30pm Update: Moderate to heavy snow continues to fall from southeast Wisconsin back through Dixon this evening. 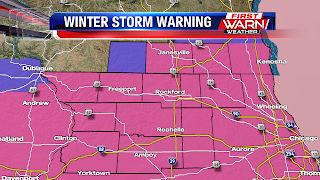 Snow totals range anywhere from six to eleven inches where the heaviest snow occurred Sunday afternoon and evening. Moderate to heavy snow will continue through Midnight before shifting east early Monday morning. Snow plows have been pulled off the roads in Whiteside, Lee and Ogle counties and the Lee County Sheriff's department says due to very hazardous county road conditions county squad cars are not able to make it down township or county roads. If you get stuck on any secondary roads, you will need to find another way to get out. Most tow trucks are not able to reach people either. 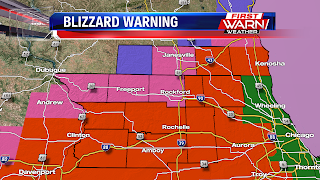 A Blizzard Warning remains in effect for the following counties: Boone, McHenry, Ogle, Lee, DeKalb, Carroll and Whiteside counties while a Winter Storm Warning remains in effect for Winnebago, Stephenson, Jo Daviess, Rock and Walworth counties. 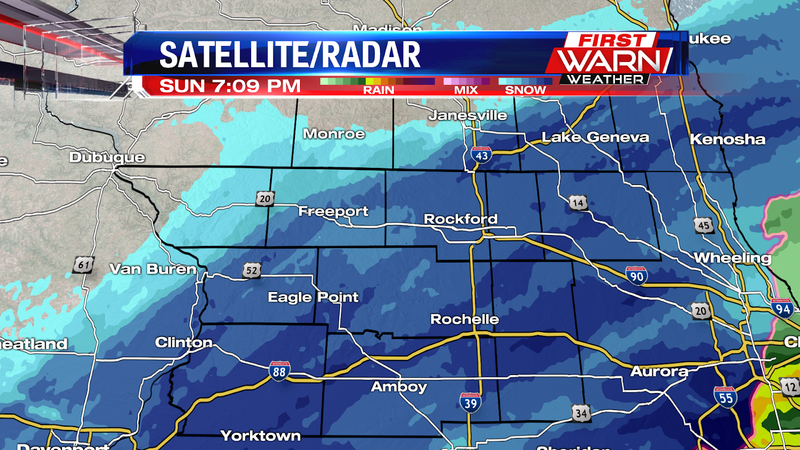 Daviess, Stephenson (with Lena reporting only very light snow and no snow in Orangeville) to Monroe. Snowfall totals range already from six to nine inches of snow with many likely receiving over a foot of snow when this is all said and done! Monday morning, but the impact will likely still be felt with blowing and drifting snow through the morning commute. Travel is NOT advised this evening as roads are completely snow covered and snow plows may have a hard time keeping up until the snow has lightened up a little. 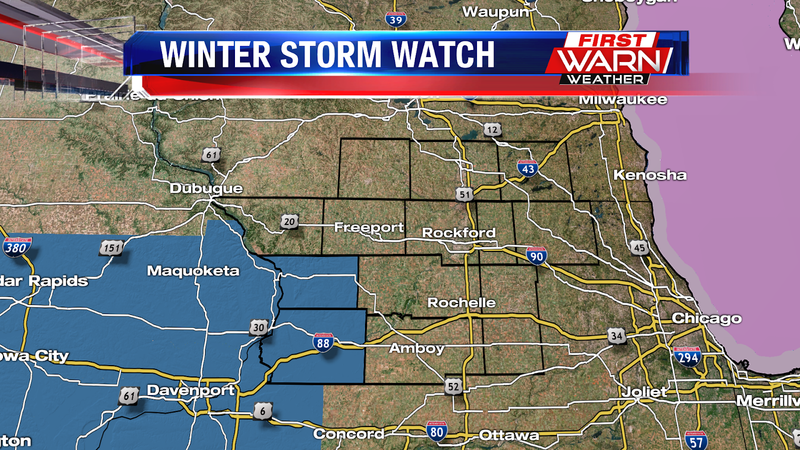 Thundersnow has also been reported over parts of Lee, DeKalb and southern Ogle counties this evening. 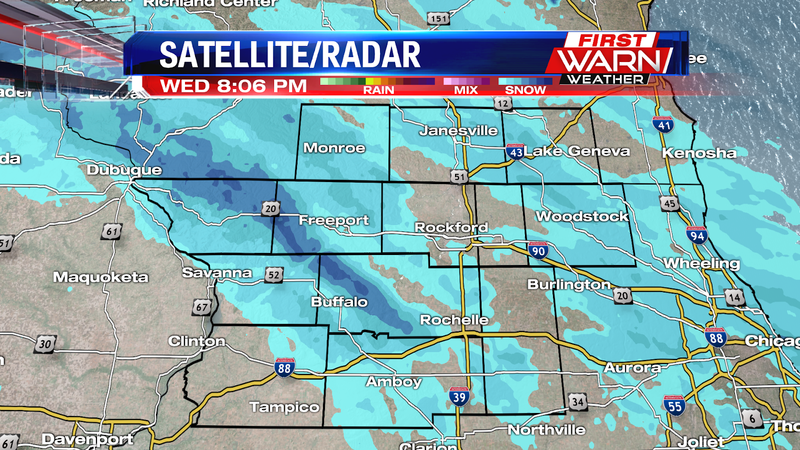 Any thundersnow that does occur will only work to increase snowfall rates and intensity. Winter Storm Warnings have been issued for all of northern Illinois and parts of southern Wisconsin through Sunday evening as an early season winter storm takes aim on the Midwest. Mostly cloudy skies will continue through Saturday night into Sunday morning. Low pressure currently located over the panhandle of Oklahoma will strengthen as it moves into Missouri Sunday morning, and then into central Illinois by Sunday night. A mixture of snow, rain and sleet will be likely mid-morning Sunday before transitioning over to snow during the early afternoon. The latest run of forecast models have pushed back the onset of precipitation by a couple hours Sunday morning, closer to 8am/9am, rather than the pre-dawn hours. 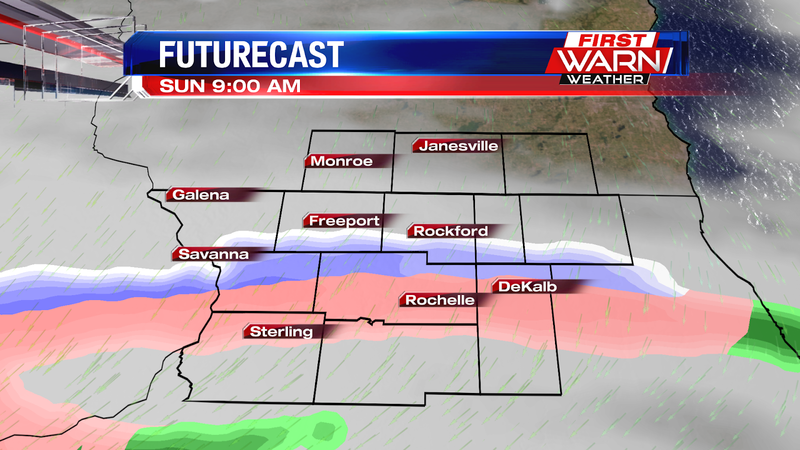 The transition over to snow, once it occurs, will be quick as heavy and wet snow will occur by the afternoon. 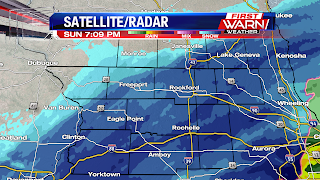 Snowfall rates up to one, to one and a half, inches per hour will be possible through the afternoon and evening. As low pressure moves out of central Illinois Sunday evening winds will increase from the North and Northeast, gusting to 35 mph. 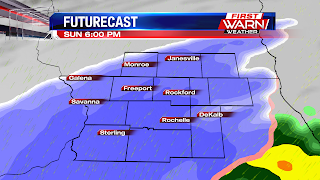 Blowing and drifting snow will be likely Sunday evening/night and early Monday morning. The window of opportunity for travel may open up a little more into the afternoon, especially if the bulk of precipitation doesn't occur until the afternoon and evening. 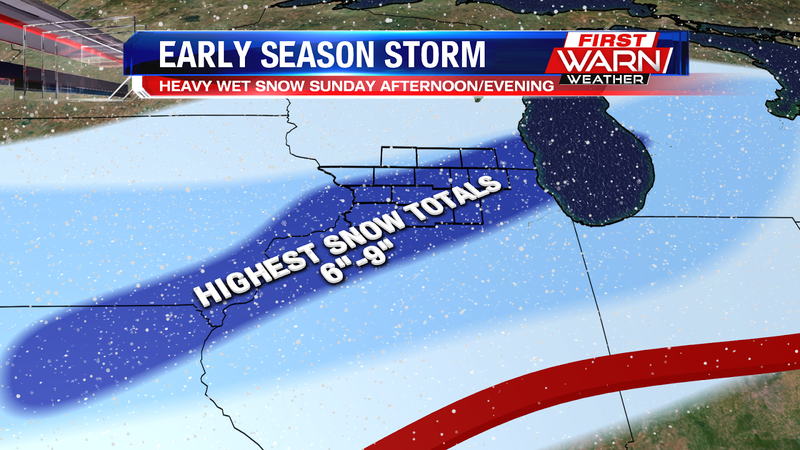 Bands of heavy snow will be likely over parts of the Stateline where snowfall totals of 6"-9" will be possible. Locally higher snow amounts can't completely be ruled out, however. High amounts of moisture in the atmosphere and temperatures in the low to mid 30's will cause the snow to be heavy and wet, otherwise known as 'heart-attack' snow. Slushy accumulations on the roads will be possible through early afternoon, with snow covered roads likely by Sunday evening and night. Travel is not advised later in the day Sunday and impacts to the morning commute are possible Monday. 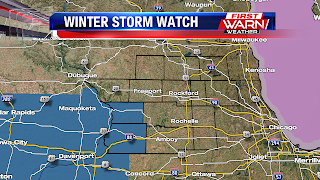 A Winter Storm Watch has already been issued for Carroll and Whiteside counties in northwest Illinois beginning Sunday morning. Those watches extend westward through Iowa, Missouri, Nebraska and Kansas. it more through central and southern Missouri Saturday, and southern Illinois Sunday afternoon. The southward shift would suggest that the heaviest axis of snow would occur over parts of northwest and northern Illinois, central Illinois, Iowa and Missouri, where over four inches of snow would be possible. However it was just Thursday afternoon that models had the low further north, so there are noticeable differences with the overall track, which will ultimately have an impact on overall snowfall amount and precipitation type locally. Because the main upper level portion of the storm system is still well off shore, there isn't an ample sampling of atmospheric data. This is causing shifts in the overall storm track, precipitation type and snowfall intensity. It's likely that additional shifts will occur as we get closer to Sunday, which may pull the surface low further north. 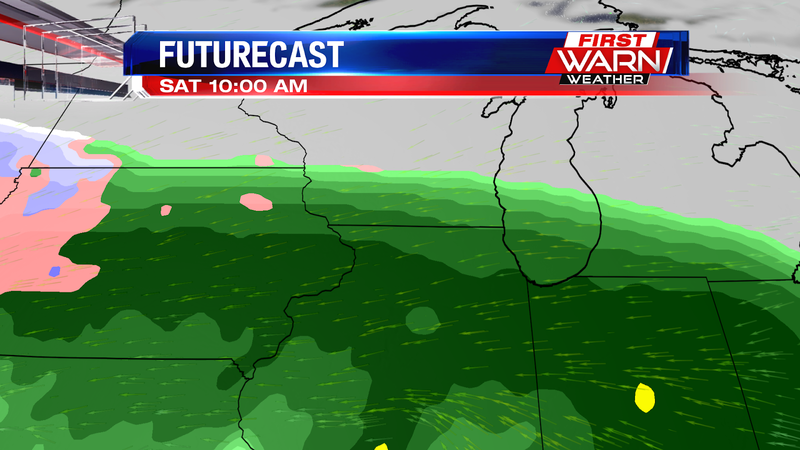 However, wherever the snow falls it'll be a heavy, wet snow with temperatures in the 30's. 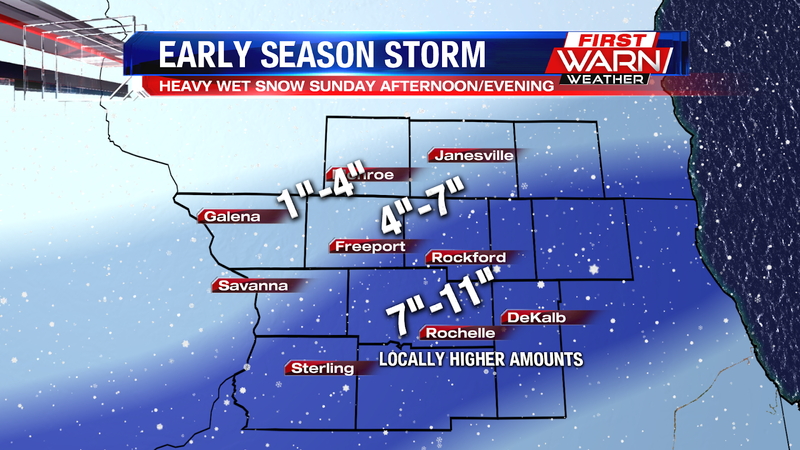 Snowfall totals to, and over, four inches are likely by Sunday night. Winds are also expected to increase through Sunday and this could cause low visibility, power outages and downed power lines across parts of the Midwest. Anyone with travel plans Sunday will need to pay close attention to the forecast, or consider changing those plans to an earlier/later date. Impacts to Monday morning's commute are also possible as many head back to work. 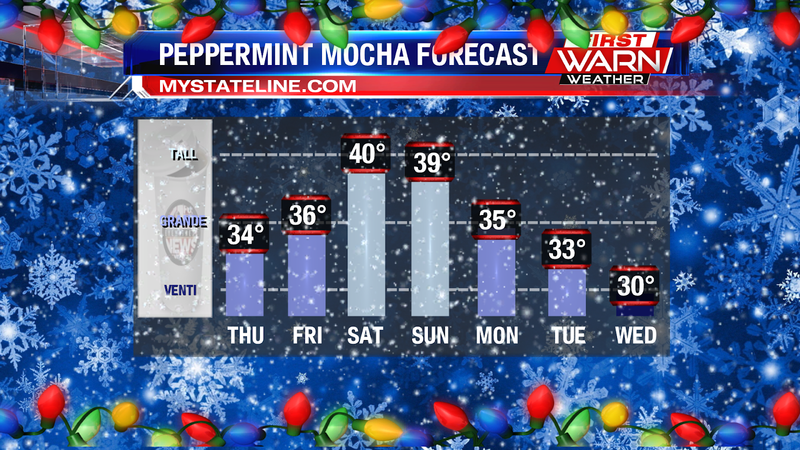 Updated forecasts will continue through this weekend as we get closer to Sunday! Two storm systems will impact northern Illinois and southern Wisconsin this holiday weekend. The first comes Friday afternoon and evening, bringing light rain to most of the Stateline through Saturday morning. The second, and stronger of the two, moves in late Saturday night and will stick around through Sunday night. Low pressure will quickly intensify over the Plains Saturday evening and night. 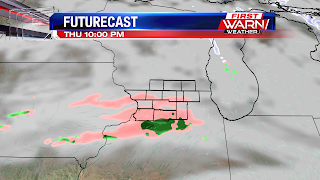 As it does, a warm front will lift into central Illinois. 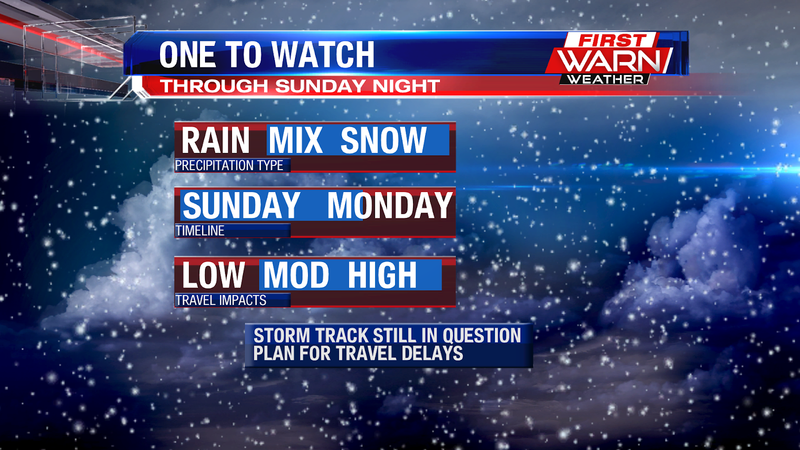 A mixture of rain and snow will begin late Saturday night, after Midnight, and continue into early Sunday morning. 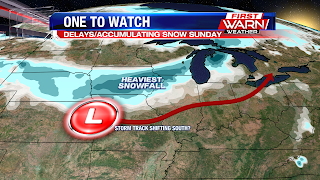 Colder air from the north will settle in over the Midwest bringing widespread, and likely, heavy snow over parts of Iowa and Illinois through Sunday. The overall track of the low is still in question and this will have a major impact on just what precipitation occurs over northern Illinois and southern Wisconsin. 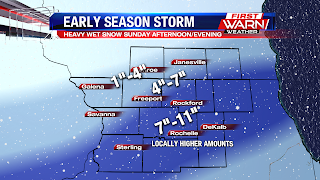 A southerly track would suggest more snow locally, but a more northerly track would allow more mild air to move into Stateline, bringing more of a rain/snow mix during the day. 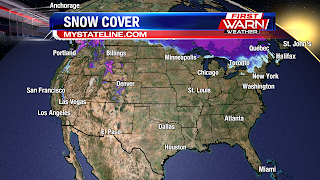 The low will pass to our east Sunday night with temperatures falling below freezing. As this occurs any liquid precipitation would changeover to all snow Sunday night, lasting into Monday morning. 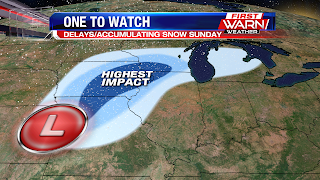 While the exact track of the low and heaviest axis of snow are still uncertain at this time, major travel impacts are likely for Sunday afternoon and evening. Those with travel plans need to pay close attention to the forecast in the coming days and may need to think about changing plans if the weather becomes too hazardous. 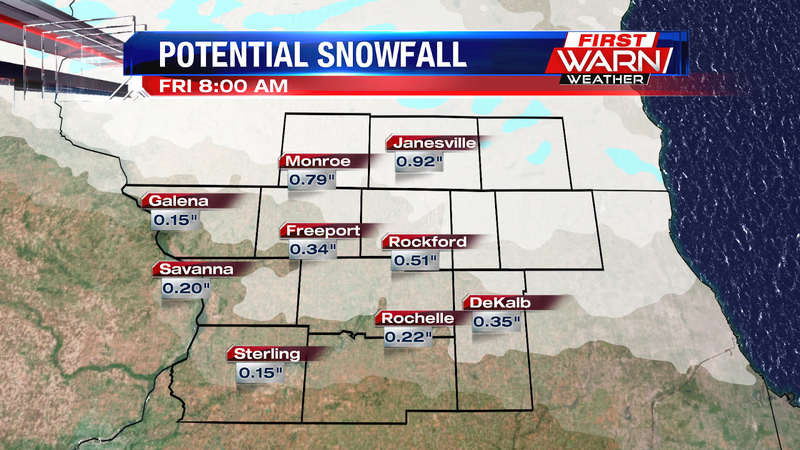 The potential is there for significant snowfall, but the exact location of that snow is less known at this point. As we get closer to Sunday we'll have a better idea on where exactly the snow will fall and be able to pinpoint totals a little more. Skies will remain partly to mostly cloudy Saturday afternoon and evening following light rain from earlier in the morning. Coming off of a stretch of some pretty chilly weather, temperatures will remain in the mid and upper 40's for Saturday afternoon. 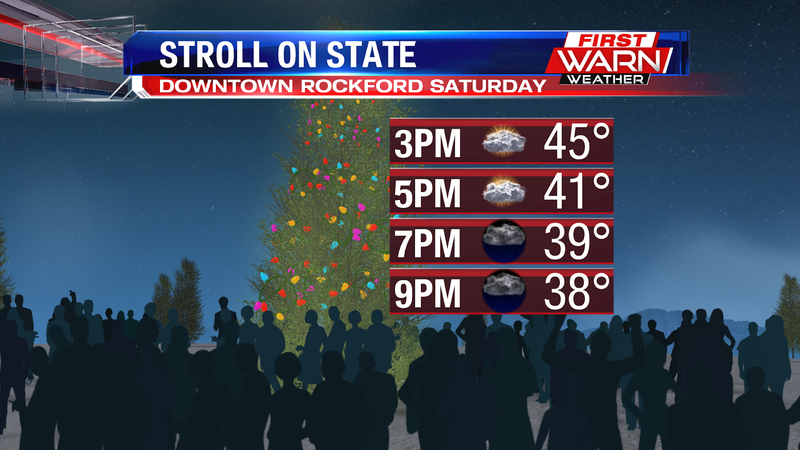 If you're heading out to Stroll on State in downtown Rockford Saturday afternoon the weather should cooperate just fine, it'll just be a little chilly. 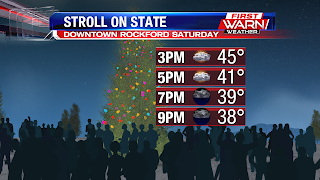 The parade kicks off at 3pm Saturday and temperatures should be in the mid 40's. By sunset those numbers will be falling back into the upper 30's. 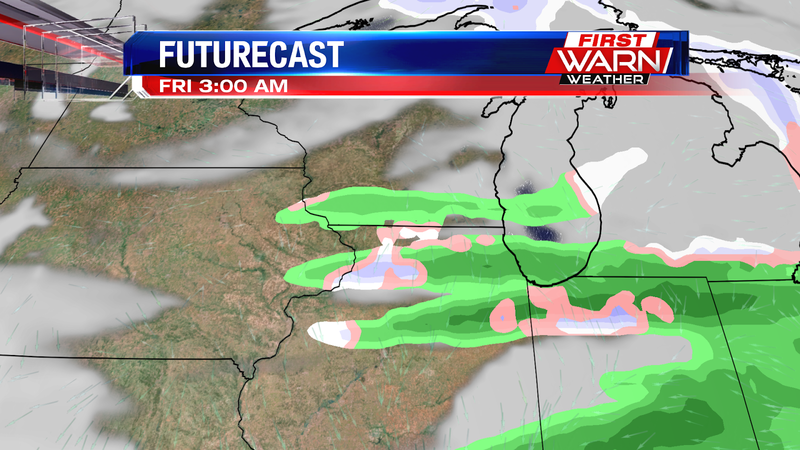 Increasing cloud cover and a rain/snow mix will be likely for Saturday night and early Sunday. After a mostly dry Thanksgiving Day rain is set to move in late Friday afternoon and evening, lasting into Saturday morning. An approaching low pressure system and cold front Friday evening will move across southern Wisconsin and northern Illinois. Southerly winds ahead of the low Thursday and Friday will draw moisture northward, leading to light rain as early as 4pm for some, but most likely developing between 4pm and 7pm Friday evening. 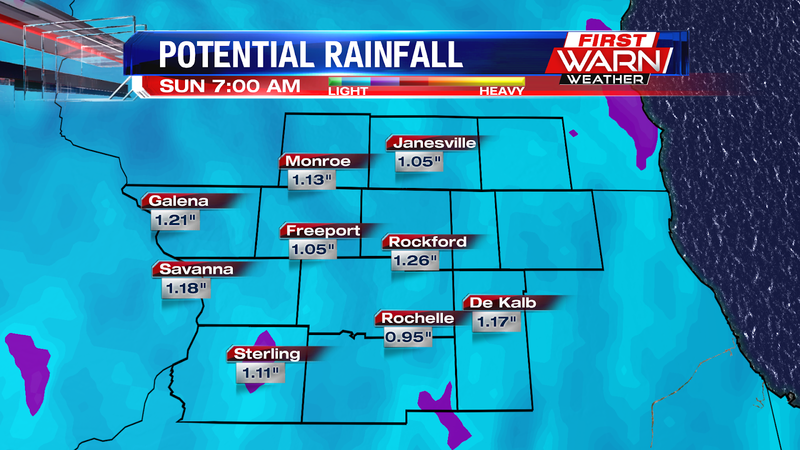 Rainfall totals will remain light and under a half an inch through mid-day Saturday. A quickly moving ridge of high pressure moves in Saturday afternoon, drying skies through Saturday evening. Temperatures both Friday and Saturday will warm into the mid and upper 40's. 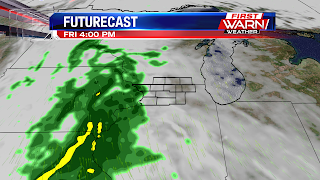 Those heading out for shopping early Friday shouldn't run into any issues, but rain may slow you down Friday evening. 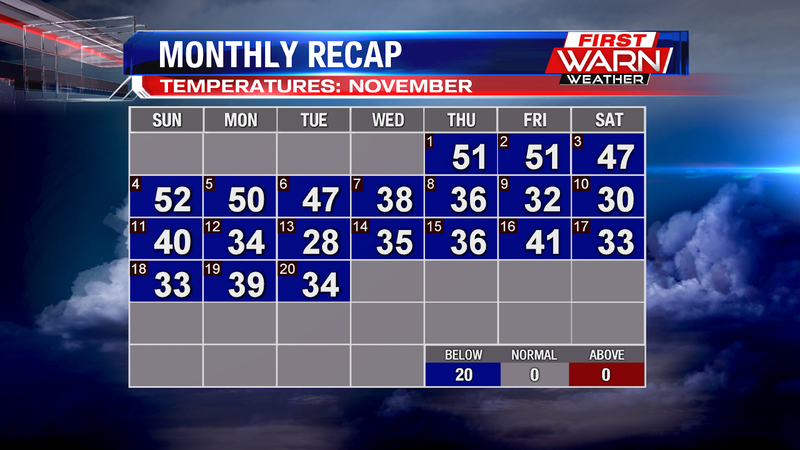 Every day this month has been below average, even if it's been by only a couple of degrees. 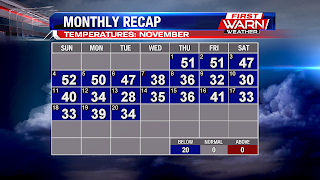 Overall the monthly temperature sits at nearly nine degrees below average for this time of year, which is currently at 33.5 degrees. Temperatures through Thanksgiving will continue to run 5-10 degree below average, but the 40's (more seasonable for this time of year) will return briefly Friday through Sunday. However, the cold pattern trend looks to continue into the last week of November and likely into the beginning of December. Thanksgiving is only two days away. If you are leaving today, in order to beat the traffic, expect a mix of sun and clouds. 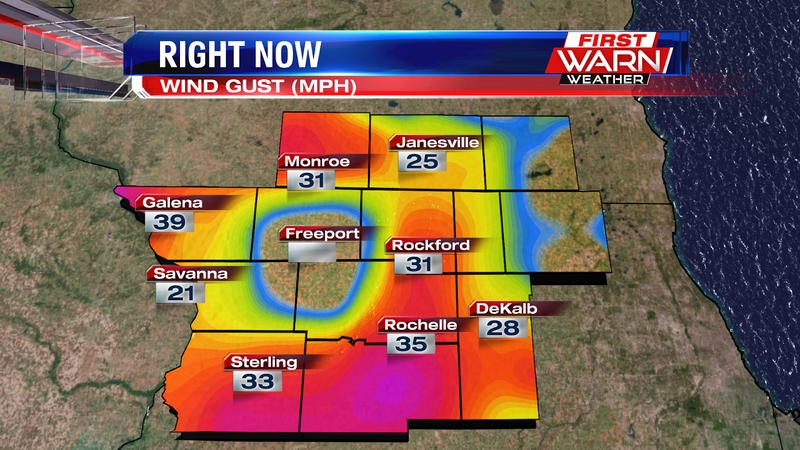 As you hit the road, it'll also be rather breezy with gusts near 20mph as highs warm into the low-mid 30s. 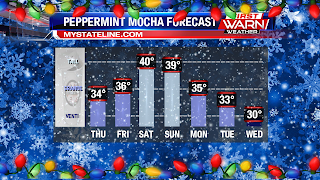 Overnight lows will dip down into the mid 20s. Clouds will build back into the area, so expect mainly cloudy skies tonight. If you are planning on traveling during the busiest travel day of the year, you won't have to worry about the weather impacting your plans. Expect highs to warm into the mid and potentially upper 30s with decreasing clouds. An "eat" wave begins Thanksgiving. We will warm to near 40° Thursday before into the mid-upper 40s Friday and Saturday. 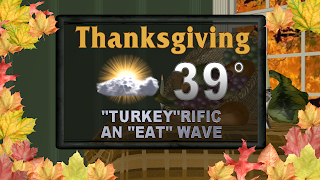 It should be a "turkey"rific forecast with partly sunny skies. We shouldn't have to worry about breaking any records, but back in 1913 we set our record warmest Thanksgiving with high of 67°. 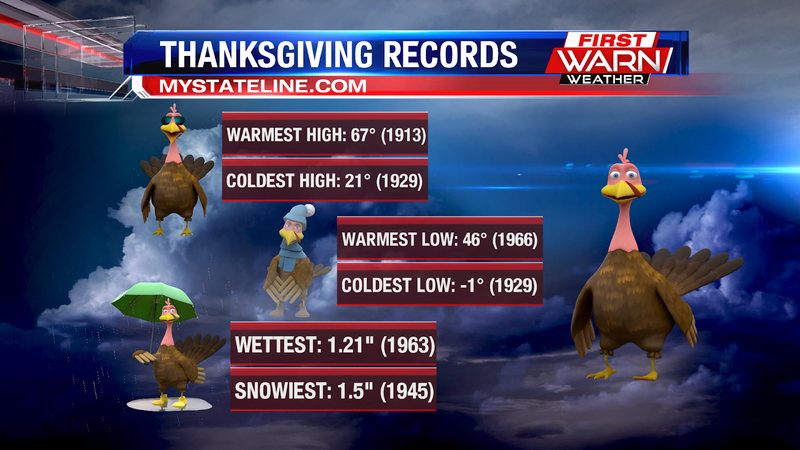 We set the record coldest high and low on the same day back in 1929 of 21° and -1° respectfully. 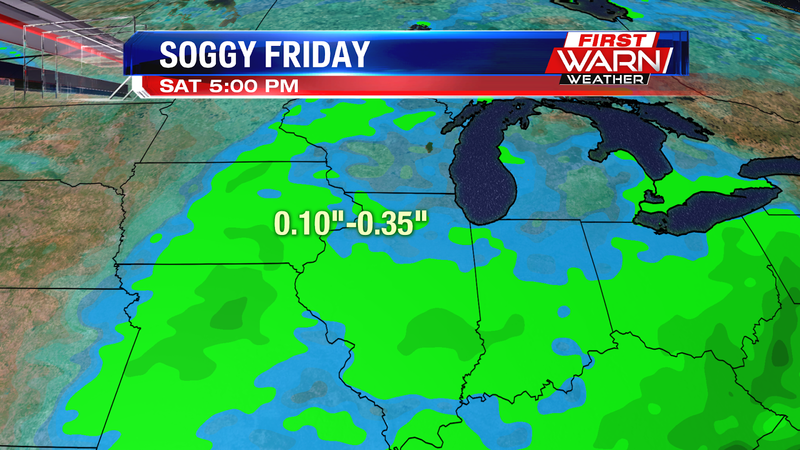 We will remain dry Thursday, but back in 1963 we saw just over 1.2" of rain and 1.5" of snow in 1945.